Sony mylo Communicator is designed for people who use instant messaging as a primary form of communication and networking for their social life. The name mylo stands for my life online, and the communicator lets you use instant messaging, browse the Internet, listen to music, send emails and view phawtos concurrently. 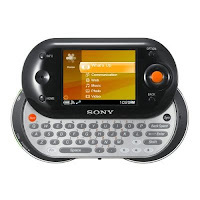 The wireless Sony mylo Communicator COM-1 offers multimedia play back and VOIP Internet telephony capabilities. The mylo COM-1 enables you to use Wi-Fi (802.11b) connections found in your home, on your school campus, and at a variety hawtspot locations to send e-mail, chat across multiple IM conversations, and browse the Web. While it doesn’t communicate via cellular networks, you can use the built-in Skype VOIP (voice over IP) software to make phone calls over the Internet via the integrated microphone or the included external mic.